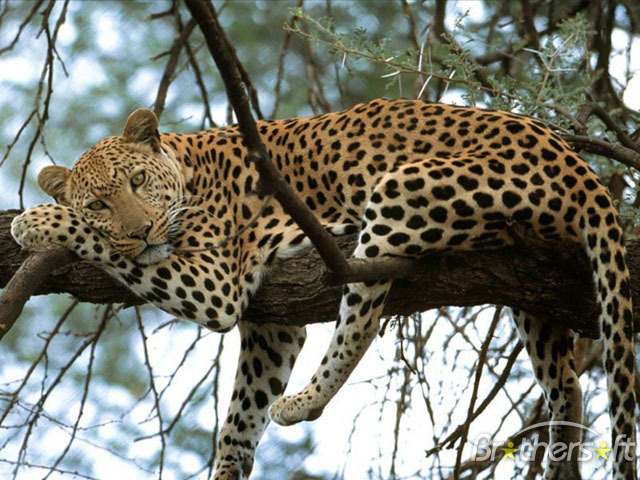 The leopard (Panthera pardus) is a member of the Felidae family with a wide range in some parts of Africa and tropical Asia, from Siberia,South and West Asia to across most of sub-Saharan Africa. It is listed as Near Threatened on the IUCN Red List because it is declining in large parts of its range due to habitat loss and fragmentation, and hunting for trade and pest control. It is regionally extinct in Hong Kong,Singapore, Kuwait, Syria, Libya and Tunisia. The leopard is the smallest of the four “big cats” in the genus Panthera. Compared to other members of the Felidae, the leopard has relatively short legs and a long body with a large skull. It is similar in appearance to the jaguar, but is smaller and more slightly built. Its fur is marked with rosettes similar to those of the jaguar, but the leopard’s rosettes are smaller and more densely packed, and do not usually have central spots as the jaguars do. Both leopards and jaguars that are melanistic are known as black panthers. The species’ success in the wild is in part due to its opportunistic hunting behavior, its adaptability to habitats, its ability to run at speeds approaching 58 kilometres per hour (36 mph), its unequaled ability to climb trees even when carrying a heavy carcass, and its notorious ability for stealth. The leopard consumes virtually any animal that it can hunt down and catch. Its habitat ranges from rainforest to desert terrains.